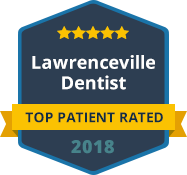 Lawrenceville Family Dental Care serves the residents of Lawrenceville and Gwinnett County with top quality dentures as well as complete dental care. We are a comprehensive, family dental practice serving children and adults of all ages. Our practice offers a full range of denture solutions including full, partial, flexible partial, immediate and over dentures. Using the latest in advanced denture technology in restorative dentistry, we create dazzling smiles that brighten our patients' lives. If you are looking for the best dentures that Gwinnett County has to offer, call the experts at Lawrenceville Family Dental Care. Our family dental practice consists of talented denture dentist that are highly trained and experienced in denture dentistry and provide full, partial, flexible partial, immediate and over dentures that are natural in appearance and made to last. Your smile is an important part of your overall appearance and directly affects your confidence and self-esteem. If you are currently living with missing teeth or uncomfortable, ill-fitting dentures, schedule a consultation with one of our denture experts today. We can improve the appearance of your smile as well as your quality of life with one of our advanced denture solutions. For premier dentures in Lawrenceville, you can count on the professionals at Lawrenceville Family Dental Care. Call us today to schedule an appointment with one of our talented denture dentist. In addition to dentures, our family dental practice also offers a full range of preventative, restorative and cosmetic dental services including sedation dentistry. We can provide all the dental care you need for your entire family. We are currently accepting new patients and we accept most dental insurance plants. Our practice also welcomes patients who are not covered under a dental insurance plan. Contact our office today. We thank you for allowing us to take care of your dental needs and we look forward to exceeding your expectations.